During the Easter break, we drove out to Rochester and visited Diggerland. As you might expect, it's a theme park but instead of typical rides, all they use is standard construction machinery. Once you pay your entrance fee you try any of the machinery as long as you're five and above. The controls are a bit confusing at first but it doesn't take long to get the hang of it. It's brilliant for the kids. Where else can they get the chance to operate heavy machinery? 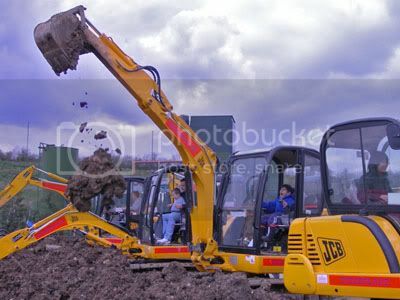 The picture shows Jenny and K* having a go on some of the bigger diggers. The entrance fee is a bit steep at £12.50 per person as the lines can get quite long so you can spend a lot of time waiting for a go. If you book ahead on the Internet, you can get discounted family ticket. Given the cost, Jenny was determined to have a go on everything! We also dropped by Bluewater Shopping Centre which is close by. It's one of the largest shoping centres in the UK - it even has a climbing wall and boating lake. Makes for a good day out.